[Limited edition for 2013] Just three weeks after announcing this flavor, Ben & Jerry's latest creation is in my possession and ready for review. $5.69 is an awful lot to pay for a lunchtime pint (from a grocery store no less), so let's hope it's worth it! That's a bold opening shot. The only thing similar I can think of is my beloved Butterfinger candy bar. So I setup this next shot by attempting to taste base first and I got a bit of something-something going on, but then I tried that HUGE hunk of swirl that was sticking out in the first photo and BAM, I was stopped dead in my tracks. Wow, just wow. Talk about being hit over the head with a flavor. I know it's been awhile since I've had one of those yellow wrapped butterscotch hard candies, but now that I think about them, this does remind me of that. 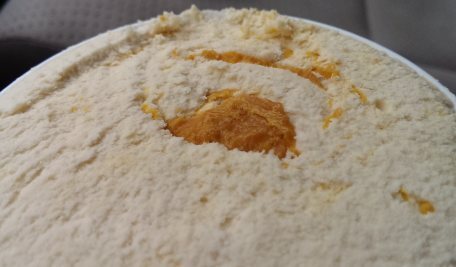 So it's familiar, but it's just jarring in an ice cream. I think Ben & Jerry's needs to adjust the description on this flavor, I mean, just look at this swirl, it's immense. Technology wise, I love that they've built such a unique swirl, but consumer wise, call it a butterscotch candy swirl, or butterscotch crunch swirl, or whatever, but people need a warning. The name needs to emphasize what's really going on here. You know how butterscotch candy can have a certain intensity to it? Well, this swirl has that in spades. I wish I knew the right word for it, but hopefully you know what I mean. Look, I know I've been hard on Ben & Jerry's this year, and I don't mean to be and if you read closely most reviews are "it's well done but...". This is another case of that, it's not that it's bad ice cream, it's just shocking. It's like the polar opposite of the too subtle Rockin' Blondies. I guess I just don't understand what's up with B&J this year. They've had a couple of hits with me, but several flavors have lost that middle of the road appeal. On Second Scoop: I didn't want to release this review without a second scooping. It's kind of a necessity when a flavor is so shockingly different then what you expected. So, I started nice and slow, and started wondering if maybe I was being too hard on this one... and then I had some more of the swirl. It's not that it's a overpowering sugar rush for me, it's the flavor itself, it's too much, and I like butterscotch... but maybe not as much as I thought I did. Nick's Note: I’m not going to lie; I wasn’t impressed when I first heard about Scotchy Scotch Scotch. You guys all know I love butterscotch but I was disappointed in the flavor’s description. It sounded way too similar to a limited scoop shop only flavor they had last year. I also felt there was so much wasted potential. I felt there should be at least 3 butterscotch components and my all-time favorite cookies, oatmeal scotchies, would’ve fit the bill perfectly. There wasn’t anything that made me need to go and buy this flavor since I was expecting just butterscotch ice cream with a liquid butterscotch swirl. After I read Dubba’s review however, I knew I had to go pick this one up. When he said this flavor is for butterscotch lovers only, he was right. This stuff is potent and you truly need to have a special place for butterscotch to truly appreciate this flavor. For a butterscotch lover such as myself, I loved every spoonful of it. I enjoyed it so much that it actually just broke into my top ten all time for Ben & Jerry’s flavors. 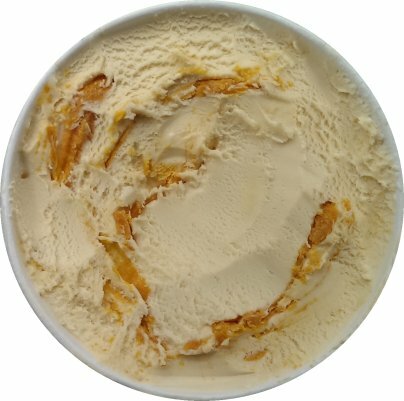 There’s just something about the combination of the butterscotch ice cream and crunchy butterscotch swirl that makes this flavor outstanding. That said, this could’ve easily secured a spot in my top five if they had included oatmeal scotchies. As is though, I would recommend giving this flavor a try if you think you enjoy butterscotch enough. If not, I’d advise extreme caution because this can get overpowering very fast. Now if only this will spark a trend in the ice cream world and we’ll have a butterscotch renaissance! Well Ron Burgundy was very intense and bold, so do you think that's why the ice cream was translated that way? Also, this could be the reason they didn't add the 3rd scotch like you had suggested in the past. I can't wait to finally find this one and see for myself! Not a single Scotchy Scotch Scotch review online has mentioned where the reviewer acquired this gem. I want to experience the overpowering butterscotch goodness for myself, pray tell where you found it! this bold beast (that definitely doesnt need more 'scotch) was found at Stop & Shop. Gabe, I've also found it at Price Chopper. 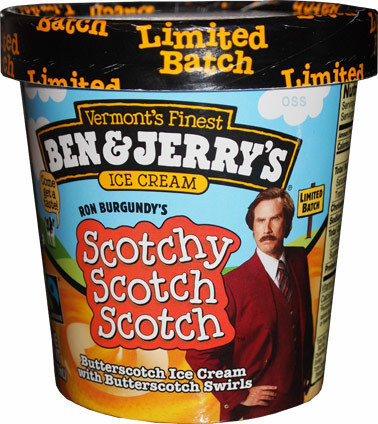 I was disappointed that there was no scotch infusion or flavor... seriously its Ron Freaking Burgundy inspired!! Impulse buy said they bought it at a Ben & Jerry's Scoop Shop. I don't know where this reviewer bought it for $5.69, but that sounds like gas station/convenience store prices. My Target has B&J for under $4, but I haven't seen this flavor yet. this reviewer(=me=Dubba) can find B&J anywhere from $3 a pint to $5.69 a pint (recent price increase from $5.49 at this particular store). As you get closer to Boston, everything gets more expensive, including food. I could have also went to a scoop shop but they are notorious for be over five bucks a pint. Does anyone know where I can find this flavor in the NYC area? 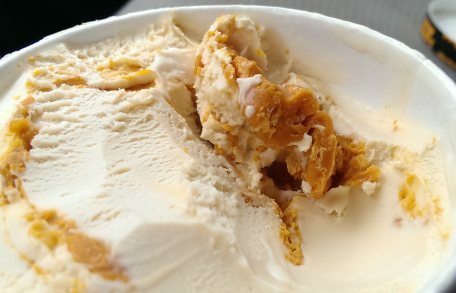 I've never had this, so I can't say for sure, but it seems that Butterfingers would be an awesome mix-in because they are really a cross between peanut butter and butterscotch. @Stride, while I agree a peanut butter mix-in would work, I'm not sure butterfingers would be the best. You already have a crunchy element from the butterscotch swirl and the butterfinger might make things way too sweet. I'd think something chewy or crumbly like oatmeal scotchies would work awesomely though. My daughter and I love this. Reminded us of the butter rum lifesavers at Christmas. We would like to get some more...is it still available?